Give your shoes the proper polish with our silver jacquard spats! 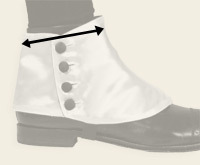 Our spats are the genuine article, with real fabric buttons, durable cotton lining, and fine silver jacquard body. Our four-button mens spatterdashes will turn any perambulation into a tickertape parade. Great spats. High quality. Better than I expected. I’m using my spats on a character I’m creating for use at the Port Of Ludington Maritime Museum. You should see it. Fabulous. True to size! Very nice! These are so very, very high quality. They're listed as 'silver' but I feel a more accurate description of the color would be 'pearl grey'. And the sizing chart that accompanies the various spats available is absolutely spot-on. They fit as if they were custom-made. I am consistently amazed by the quality of every single item I've purchased here, and these silk spats are no exception. I just received a pair silver jacquard spats. As part of a 1920's costume it seemed like a good add on. I am very impressed! Good material and nicely finished. Clearly, you get what you pay for. The label stated Historical Emporium so was a unique product. I am very happy with them. Where did you get those spats? The very first time I wore these I was asked, twice, where I had procured them. "I have been looking for spats like those, where ever did you find them?" Indeed, these spats are much nicer than the typical sort of spats you might find. I am quite pleased with them. These spats do not slide around or misbehave the way poorly made spats might. Note that I used the sizing advice and found it to be accurate. Measure your ankle and buy with confidence. Good product. Looked good and functioned well. These spats are made extremely well and are of beautiful material! The other very important factor is that they button and unbutton easily. And when you need to get in and out of them quickly like I do, this is a pretty important deal. I'm so glad that I found you guys!! I will definitely be ordering from you again!! Thanks a million! !